It most often refers to plants or plant-based materials. Humans have harnessed biomass-derived energy since the time when people began burning wood to make fire. Even in today’s modern era, biomass is the only source of fuel for domestic use in many developing countries. There are many types of biomass but wood based fuels like logs, pellets and chips are the ones most commonly used. Logs and pellets are used for both domestic and commercial properties with chips being used mainly for commercial applications. A biomass boiler will need more space than a traditional boiler and cannot be wall hung. Biomass boilers come in a variety of shapes and sizes. The utility models look much like a conventional boiler and are usually sited in plant rooms and garages. Pellet stoves with boilers are more contemporary and are designed to be seen and enjoyed. Cooker models with boilers are also available to replace your existing oil fired Aga or Rayburn. Pellets are easier to use and much more controllable than logs running similar to a traditional boiler. They have hoppers which refill the boiler automatically at regular intervals which, depending on the size of the hopper can hold enough fuel for a couple of days through to the entirety of the heating system. Log-burning stoves and boilers have to be filled with wood by hand. They require considerably more work, and you will need a lot of logs to heat a whole house, but are generally cheaper than pellets if you have a good local supply. 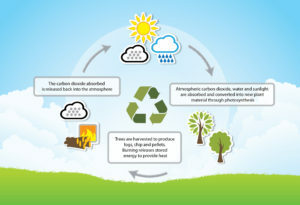 Carbon dioxide in the air is absorbed by plant life, using energy from the sun. The carbon dioxide emitted when wood is burned is the same amount that was absorbed over the months and years that the plant was growing. The process is sustainable as long as new plants continue to grow in place of those used for fuel. This is why biomass can be considered as carbon neutral. Savings in carbon dioxide emissions are very significant – up to 14.5 tonnes a year when a wood-fuelled boiler replaces a solid (coal) fired system or electric storage heating system. If you have any questions regarding biomass please do not hesitate to contact one of our team. Alternatively, book an appointment to visit our energy BY DESIGN where we can discuss your requirements in more detail.